I have a little problem. I'm addicted to cookbooks, food writing, recipe collecting, and cooking. I have a lot of recipes waiting for me to try them, and ideas from articles, tv, and restaurants often lead to new dishes. I started losing track of what I've done. So now I'm taking photos and writing about what I've prepared—unless it's terrible in which case I forget it ever happened. 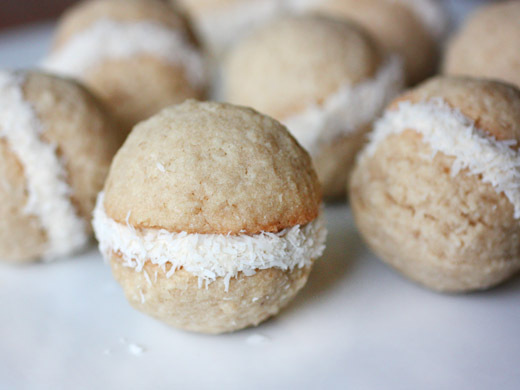 Coconut is great for holiday cookies as it provides instant flocking. Snowy, fluffy coconut is an easy decoration, and it would have been even better if I had used the regular kind. No, I had to go ahead and use the bag of natural, shredded coconut that I already had at home. The natural kind is delicious, and it has no added sugar, but the shredded pieces are smaller and less exciting-looking as a decoration. Next time, I might bother to get regular shredded coconut instead, but still, these cookies were cute and tasty just as they were. These sandwich cookies are the last ones I have to show from my cookie platter this year, and once again, they’re from last year’s Holiday Cookies publication. The recipe is also online. They weren’t difficult to make, but the dough was a little temperamental. It’s a somewhat dry and crumbly coconut dough, so you have to pack it a bit in an ice cream scoop to form domed shapes for baking. Once baked, the cookies held their shape well, and the filling was a simple schmear of vanilla buttercream. As usual, flour, baking powder, and salt were sifted together into a bowl. Some shredded coconut was coarsely ground in a food processor and added to the flour. 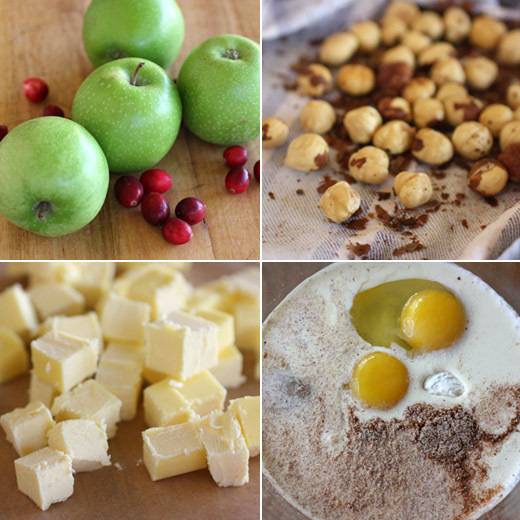 Butter, sugar, and brown sugar were creamed together in a mixer, and an egg and vanilla were added. The dry ingredients were slowly incorporated, and the dough was ready to be scooped. As I mentioned, the dough was a little crumbly and had to be packed firmly in an ice cream scoop to form domed shapes. The cookies baked for about twelve minutes and then were left to cool before being filled. The vanilla buttercream was an easy mix of softened butter, confectioners’ sugar, and vanilla extract. The flat sides of half the cookies were spread with the buttercream, sandwiches with the other half of the cookies, and then rolled in shredded coconut. One more detail I would add to the next-time file would be to slightly decrease the size. They were just a little bit bigger than I would prefer for a sandwich cookie. It might seem like I’m doing a lot of complaining about these cookies, but they were, of course, delicious or I wouldn’t be mentioning them at all. With a smaller scoop for the dough and regular shredded coconut for the decoration, we’ll have a completely perfect cookie next time. I promised to show some holiday cookies, so on with the cookie parade. 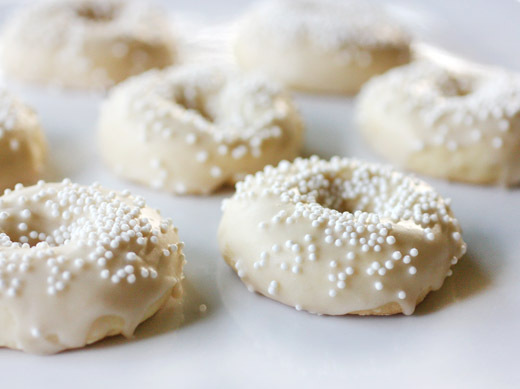 This is another one from the Martha Stewart Holiday Cookies publication from last year, and the recipe is available online. The flavors in these chocolate peppermint cookies are very similar to the chocolate mint sandwich cookies I mentioned back in March. But, I think these have a much more festive look. 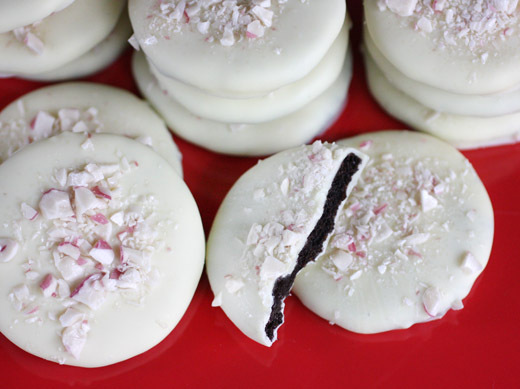 Here, peppermint extract is added to the chocolate cookie dough rather than the white chocolate as in the sandwich cookies, and each cookie is completely covered in melted white chocolate. Broken candy canes decorate the tops. The cookie dough was rolled out and cut into circles, but it would have worked just as well to form the dough into two logs and slice cookies from them. I’ve learned that regardless of whether the mint flavor is added to the chocolate cookie dough or the white chocolate and whether the white chocolate is sandwiched between cookies or used to completely cover them, this is a flavor combination that’s well-received. 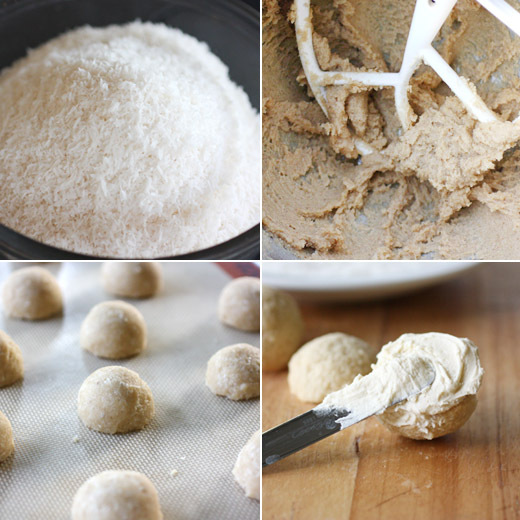 The cookie dough was started by sifting together flour, cocoa powder, baking soda, baking powder, and salt. In the bowl of a mixer, butter and sugar were creamed until pale and fluffy. One egg and one egg yolk were added followed by the peppermint extract. The flour mixture was slowly added, and then the dough was divided and formed into two disks which were covered with plastic wrap and chilled for at least an hour. This is a sticky dough, so it’s best to roll it out between pieces of parchment paper. It may also need to be chilled before cutting rounds. Once all the cookies were cut, they were placed on baking sheets and chilled again for 15 minutes before going into the oven. 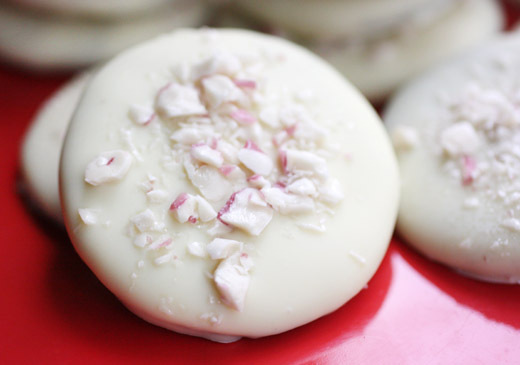 After baking and cooling, each cookie was dipped in melted white chocolate and topped with crushed candy cane pieces. 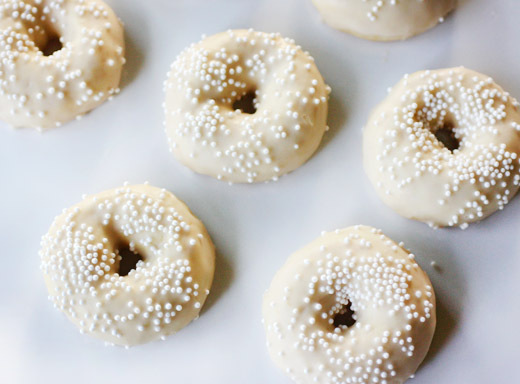 They have a snowy, pretty look and fresh, mint flavor. The broken candy cane pieces on top of each cookie add visual appeal and also make the cookies more easily stackable without sticking to each other. I might go back to the sandwich cookie version when it’s not the holiday season, but this mix of flavors is a winner any time. All cookbooks are intended to inspire the reader to cook, right? Yes, but this one presents itself as “A Passionate Plea for Home Cooking,” and it really does encourage everyday cooking no matter how busy you might be. The new book from John Besh, My Family Table , lays out exactly how to make home-cooked meals happen for every occasion including all those dinners for the middle of a hectic week. I received a review copy of this book and couldn’t put it down once I started reading. This isn’t a typical chef-cooking-at-home kind of book. Besh shows how meals from breakfast to dinner, every day of the week, can be easily prepared at home without relying on packaged, manufactured food. The first chapter sets the tone by showing how basic recipes for risotto, vegetable soup, pasta, fruit crumble, and curry can be made in any season with whatever fresh ingredients you might have at the time. With a well-stocked pantry, and he describes what might be included in one, a few vegetables, and possibly some leftover meat if you’d like, these dishes can be on the table quickly. From there, the book takes you through meals for Sunday Supper when you might have more time and can prepare some things in advance for the coming week. Then, there’s one pot cooking in Dinner from a Cast Iron Pot, followed by School Nights, and Breakfast with my Boys in which you learn how Besh’s busy family plans and prepares their meals. There are also some chapters for specific types of cooking and special occasions like How to Cook a Fish, Fried Chicken, Barbecue Wisdom, Jazz Brunch, Goose for the Holidays, and Drew Makes a Cake. Throughout, it’s encouraging, never intimidating, and emphasizes the value of shared meals at home. The first recipe I tried from the book was the potato chip-crusted fish with sambal mayonnaise, and I’d like to suggest that you try crusting anything at all with crushed potato chips mixed with some flour. It’s a delicious coating for fish, and I imagine it would be stellar on chicken or tofu too. The mayonnaise was pureed with piquillo peppers, sambal chile paste, and lemon, and again, this would be a fine sauce with many, many things. Next, I flipped back to that first chapter in the book in which the recipes were guidelines for using what you like and what you have on hand. In the book the “curried anything” recipe is shown with chicken, eggplant, and summer squash, and that’s the version of the recipe included below. In the headnote, Besh explained how easy it is to alter a curry by using seafood, beef, or all vegetables. 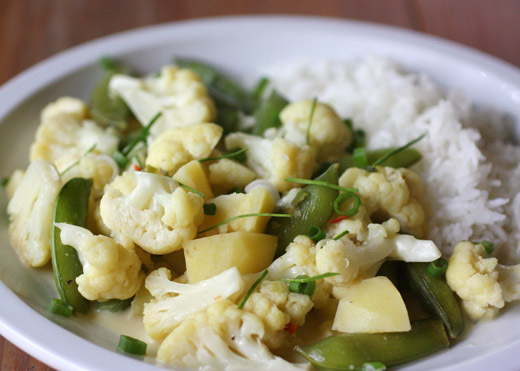 He noted a good meatless variation would be a curry of cauliflower and sugar snap peas, and that’s how I made it. With the basic technique and building blocks of flavor, you can make it any way you wish throughout the year. 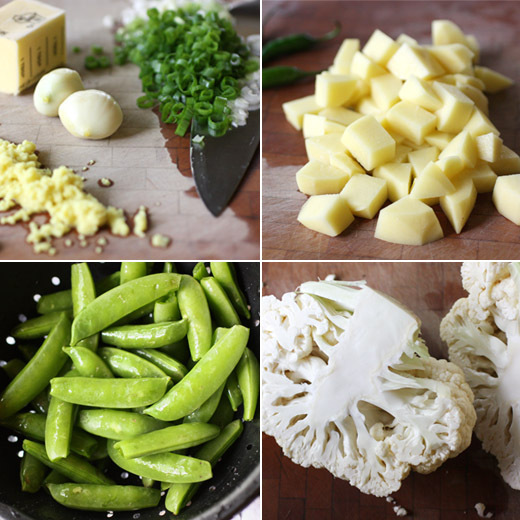 Speaking of cauliflower, I look forward to trying the mac and cheese recipe made with leftover roasted cauliflower. There’s also a chicken and noodle pan fry made with an easy peanut sauce, and a Southern soup au pistou with ratatouille in it. And, with ideas like a self-serve smoothie bar, pickled shrimp, and crab-stuffed avocados, I want to throw a brunch party. Whether you need some ideas for meal planning for the week or dishes for weekend parties, this book will get you cooking and sharing more meals at home. Recipes for curries vary almost more than any other dish, which is great because you can hardly go wrong. Curries make delicious use of last night’s roast pork, chicken, beef, or seafood, and they are a wonderful way to serve just vegetables as a main course. Use 2 cups of cooked meat, as in our family staple here, Eggplant and Chicken Curry; it’s Brendan’s favorite. 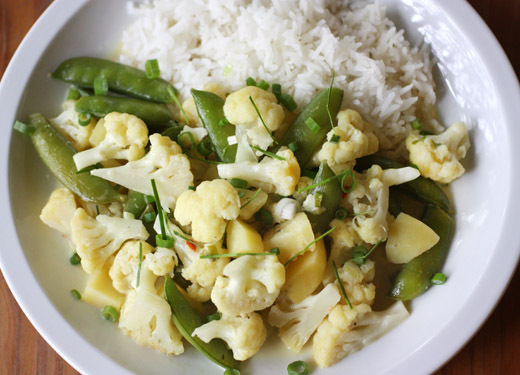 Or make a curry of cauliflower florets and sugar snap peas as a meatless variation. Either way, make it as spicy as you wish, tasting as you go, adding small amounts of curry powder and chili paste until the heat is just right for you. Curry powder is a combination of spices whose potency varies with the manufacturer, some have more cumin and coriander, others more ginger and chili powder. Since this isn’t a book about the nuances of South Asian cooking, I’ll not insist you make your own, but I do hope you’ll sample a few curry powders to find your favorite. As for rice, use what you have, but I love basmati and jasmine rice. You can even use brown rice. 1. Melt the butter in a large saucepan over high heat, add the eggplant, and sauté until soft. Add the ginger, green onions, and garlic. Sprinkle the curry powder into the pan and toast for a moment. Add the squash and potatoes, stirring to coat them with the spices. 2. Continue to stir for a few minutes, then add the coconut milk, broth, and chili paste. Bring to a gentle boil, add the chicken, then reduce the heat and simmer for 15 minutes. Season with salt and pepper and serve over rice. Note: For the version shown here, I left out the eggplant, summer squash, and chicken and used florets from one head of cauliflower and two cups of sugar snap peas. Trace is the restaurant at the W hotel in downtown Austin, and they just celebrated their first year anniversary. One of the fabulous things about this restaurant is the care that’s taken in sourcing the ingredients used. Their mission is printed at the bottom of the menu, and it reads "Trace is committed to creating an enriching and thoughtful culinary experience by fusing the vibrant, local personality of the Austin area with our dedication to socially responsible food. Our high-quality cuisine is prepared from local and sustainable ingredients or obtained through national partners with well-known sustainable practices." We shared a meal there this weekend so we could enjoy the current seasonal offerings on the menu and so we could test out the new bill splitting and payment service from Serve. Before we even arrived, I knew I wanted to start with oysters and a glass of something bubbly. Since Gulf oysters aren’t currently available due to the red tide algae bloom, they were serving Sunberry Point oysters from Canada. 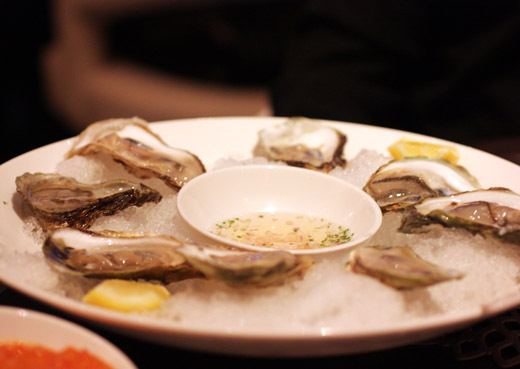 They were a nice, small size, fresh and briny, and delicious with the mignonette. 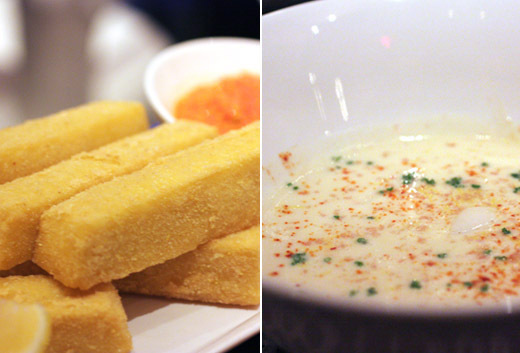 Another one of my favorite things on their menu is the chickpea fries. It’s such a simple thing really, but every time I taste them, I have no idea how they get the texture just right. They’re thick sticks of chickpea batter that are just slightly crisped on the surface. Inside, they’re less dense than you’d expect, and with a little lemon squeezed over them, they become a completely addictive snack. They’re also served with a romesco sauce, and I alternate each bite between just lemon and then with some sauce. I think I could happily live on these alone for days. Also on the menu right now is a cauliflower soup made with smoked scallops and house-cured lomo. It’s a rich, smooth soup brightened with lemon and a garnish of chives. 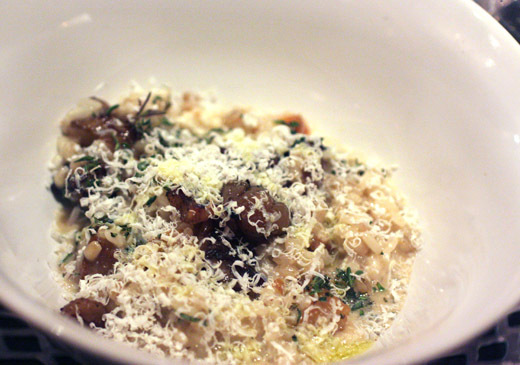 The chestnut and toasted barley risotto was a surprisingly hearty dish. With rutabaga, sunchokes, and sweet potatoes, it was fresh-tasting and very filling. The ricotta salata added a nice saltiness to the fall vegetables and barley. It was exactly the right comfort food dish for this time of year. 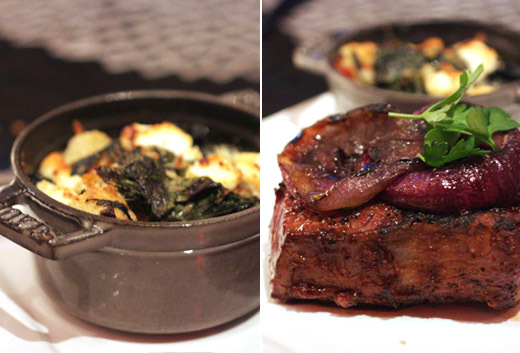 A perfectly cooked strip steak from Niman Ranch was served with house-made steak sauce and a braised organic rainbow chard bread pudding. That bread pudding could easily put all other dressings and stuffings out of business. I’m wishing I could find out how they make it so it could become a part of all of my future holiday menus. Of course, a couple of desserts were shared. 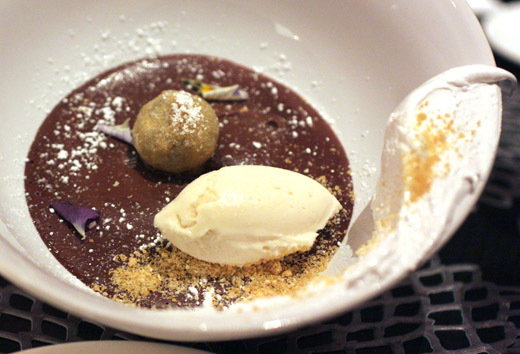 The dark chocolate pot de creme is composed of Baileys ice cream, a fried chocolate truffle, roasted bananas, and toasted banana marshmallow that’s displayed on the rim of the bowl. The chocolate and banana combination was divine. For me, no visit to Trace would be complete without the drunkin’ doughnuts. 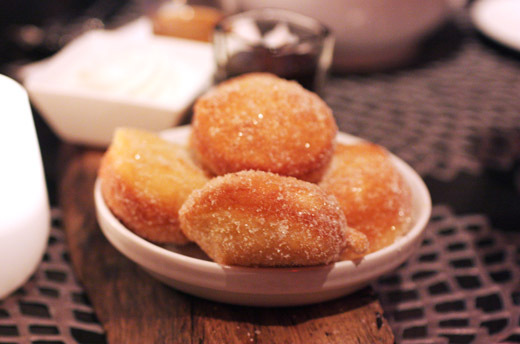 Perfect, pillowy, sugared doughnuts are served with vodka whipped cream, tequila chile fudge sauce, and bourbon dulce de leche. And, yes, I manage to get a little of all three toppings onto each bite of doughnut. Trust me when I tell you that the whipped cream is barely sweetened if at all, the fudge sauce is made with dark chocolate and is infused with chiles, and the booze in all the toppings works its magic to cut the sweetness. It’s a fun and delicious way to end a meal. Later, we settled who owed what from the check by using the Serve mobile app. Creating the account online was extremely straightforward, and the mobile app was possibly even easier to use. It includes options for splitting a bill evenly between however many people are involved and for easily sending money to one or more recipients in any amount. You can add money to your Serve account, and you can link back-up sources such as bank accounts and credit cards. It occurred to me how convenient a cash-free existence would be. If you could simply use an app to send money to your babysitter or catsitter or the neighbor boy who mows your lawn, you'd never have to worry about having the right bills on hand. I like this as a hassle-free payment option. As part of the Foodbuzz Tastemaker Program, I received a $250 stipend to try Serve from American Express. Sign up for Serve and receive $10 credit towards your first use. Comment below within the next seven days for your chance to win an extra $100 credit to your account! Official sweepstakes rules and regulations may be found here: http://www.foodbuzz.com/blogs/4622317-win-serve-dollars-giveaway-official-rules This contest is open only to US residents. I don’t know what your calendar looks like, but on mine instead of "December," it reads "Cookie Month." With parties, a cookie exchange, and several family birthdays, I get to try as many cookie recipes as I want all month long. I’ve been marking pages of holiday cookie recipes since November or pre-cookie month. So, this is the first of a few cookies you’ll be seeing here in the coming days. 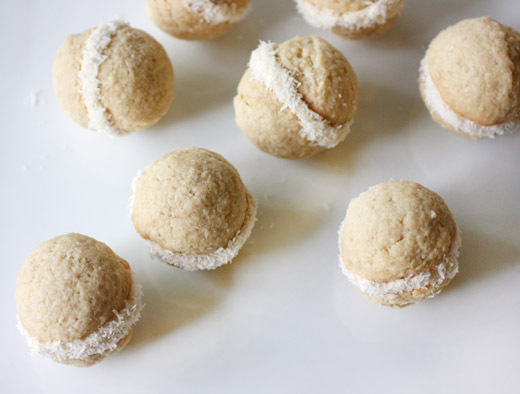 These delightful, little lemon cookies appeared in the December 2009 issue of Living magazine, and they showed up again in the special issue Holiday Cookies publication last year. I baked these for my sister-in-law for her birthday, but it was a selfish choice. These are very much like my favorite, little ring-shaped cookies that I always bring home from Mandola’s which is a nearby Italian restaurant and market. When I buy them there, they’re called anginetti cookies, but they’re also sometimes called ciambelle. They’re a little crunchy but mostly tender, they last well for days, and the bright, lemon flavor is in both the cookie and the glaze. The cookies I buy from Mandola’s don’t have sprinkles on them, but the magazine version did. I think it dresses them up nicely. To start, these follow standard cookie procedure. Flour, baking powder, and salt were sifted together into a bowl. Lemon zest and sugar were combined, and that mixture was added to butter and creamed until fluffy. Eggs were added followed by vanilla extract and lemon juice, and then the flour mixture was slowly added while mixing. 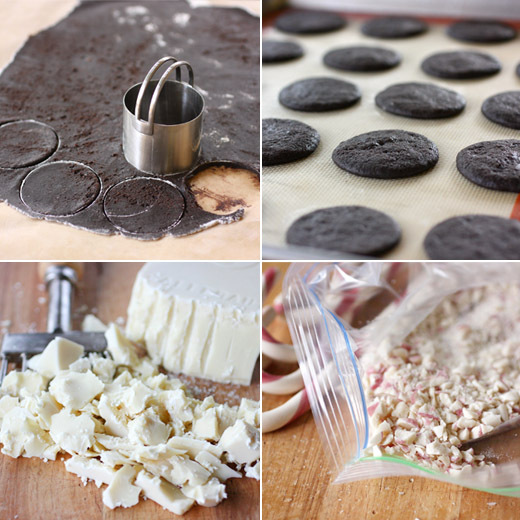 To form the cookies, one tablespoon of dough at a time was rolled into a short, four-inch rope. The rope was shaped into a ring and placed on a baking sheet, and that was repeated until all the dough was used. 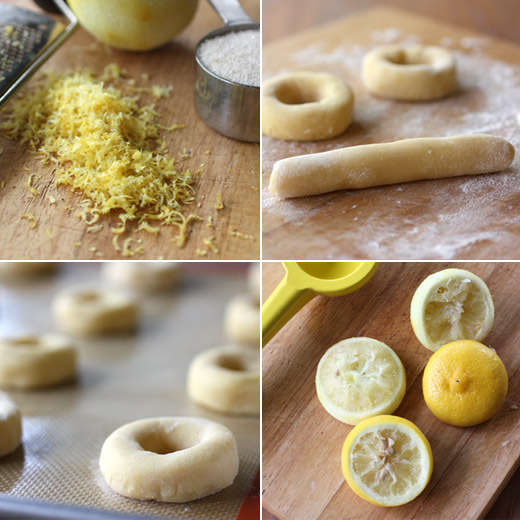 The cookies were baked and cooled, and then the lemon glaze was made from confectioners’ sugar and lemon juice. The top side of each cookie was dipped into the glaze, and they were topped with sprinkles. Once the glaze is dry, these cookies store very well, or they would have if I could’ve stopped eating them. These could easily become a regular player in my annual Cookie Month, but from now on, I’ll also be baking them throughout the year. This dish falls squarely within that category of recipes that are so simple, every ingredient really matters. It's a quick dish too. You do have to pick the mussels from the shells after they're cooked and opened, but even that step only takes a few minutes. This came from last October's issue of Food and Wine, and the total time for making this is noted as 30 minutes. I think it might have been less than that. So, about those ingredients. 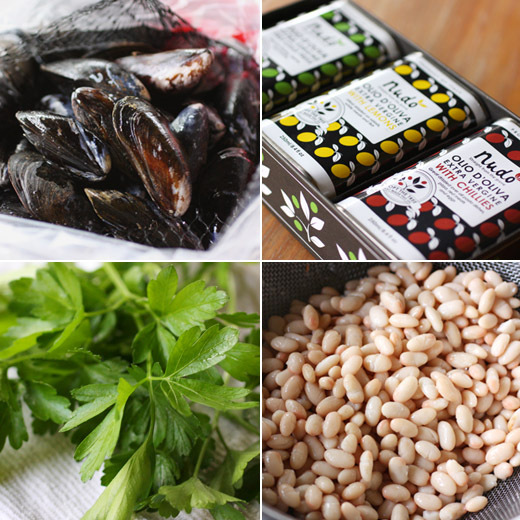 The mussels, of course, need to be as fresh as can be. They get steamed in some white wine, and then that broth is strained and added back to the stew, which means you'll want to use a wine you really like. Then, a good amount of olive oil is used for cooking some garlic and chopped chiles to begin the stew. I was lucky to have just received some olive oil samples from Nudo which is the company known for its Adopt-An-Olive-Tree program in Italy. I received two gift sets. One included three different olive oils, and the other included basil oil and a container with seeds for growing your own basil. I used the plain extra virgin olive oil for sauteeing the garlic and chiles, and I drizzled a little of the extra virgin olive oil with chilies over the stew for serving. The cooking time is so short, you definitely want to have everything prepped and ready before you start. I let the mussels sit in a big bowl of water with a little flour while I minced the garlic and chopped the chiles. The mussels were rinsed and drained and checked to be sure none were open. Then, they went into a big skillet with white wine and cooked until opened which was about three minutes. 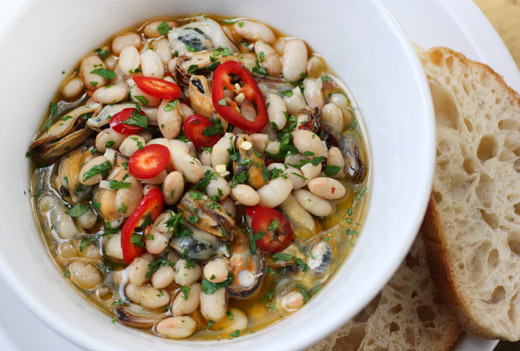 The mussels were removed to a plate, and the wine was strained into a bowl and reserved. The mussels were picked from the shells, and the shells were discarded. Next, extra virgin olive oil was warmed in the skillet, and the garlic and finely chopped chiles were sauteed. Rinsed and drained white beans were added followed by the reserved wine. That was brought to a boil and seasoned. 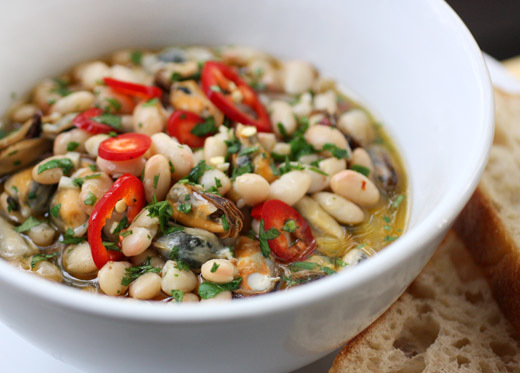 Last, the mussels were added with some chopped homegrown parsley. This is perfect on a cool, fall day, but for a stew, this one isn't too heavy. A thick slice of bread or two is a good accompaniment, and the drizzle of extra virgin olive oil with chilies was a fitting garnish. For such a simple stew, the flavors were anything but after starting with great ingredients. I have to tell you about one more Thanksgiving dish, and then I promise to move on. As usual, I was indecisive about what dessert should be, and I considered everything from a chocolate and caramel tart to various pumpkin creations. In the end, fall fruits won. Actually, that’s not entirely true. 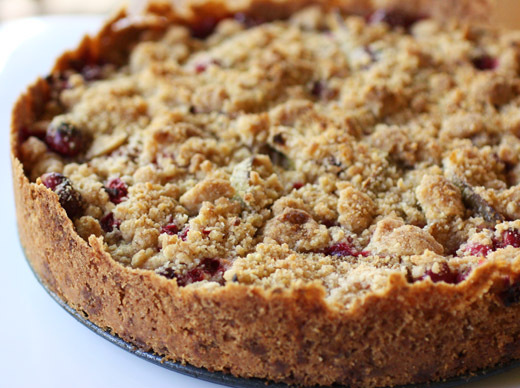 I saw a crumb tart that was originally made with summer fruits, and the crumb topping and crisp-edged crust are what won me over. 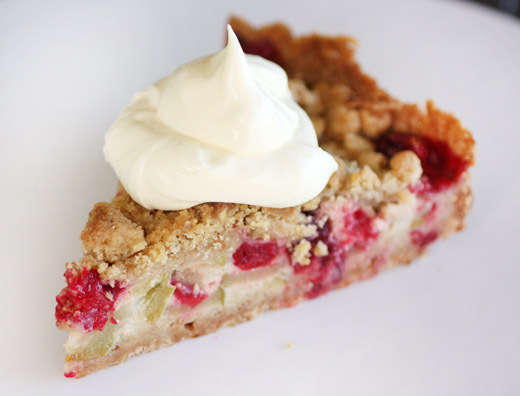 Crammed away in my files, the page with this tart had been cut from the June 1999 issue of Living magazine, and the recipe is online. I decided to switch out the raspberries and plums from the original version and use granny smith apples and cranberries instead. The important thing here, though, is really the crust. It was made with ground hazelnuts and cinnamon, and it was pressed into a spring-form pan and up the sides. I was sure that as soon as the tart finished baking, cooled, and the ring was loosened, the tall sides of the crust would crumble and fall into pieces. I was thrilled to be wrong. The lacy, crisp edges of crust held their shape perfectly even after the tart was cut for serving. There is one other interesting detail about this tart, and that’s the custard in the filling. After adding cranberries and apple pieces to the blind-baked crust, some custard was poured over the top to settle its way in and around all the fruit. With crust edges that didn’t crumble, a custard and fruit filling, and the golden crumb topping, this dessert scored well in all categories. First up was toasting the hazelnuts and rubbing them in a towel to remove the skins. Then, they went into a food processor and were pulsed until medium fine. The ground nuts were transferred to a stand mixer bowl, and flour, sugar, light brown sugar, cinnamon, and salt were added. Cold pieces of butter were added next, and it was mixed until crumbs started sticking together. Three cups of the crumb mixture was pressed into a spring-form pan, and the rest was set aside. The crust was then baked for about 20 minutes. Meanwhile, the apples were sliced, and the cranberries were washed. The custard was made with flour, sugar, an egg and an egg yolk, heavy cream, cinnamon, salt, and nutmeg. The fruit was placed in the baked and cooled crust, and the custard was poured over it. The remaining crumb mixture was sprinkled on top, and the tart baked for 50 minutes. I wasn’t completely happy with the color of the crumb topping after that amount of time, so I turned on the broiler for a few minutes to brown the crumbs a bit more. For serving, I topped each piece with whipped creme fraiche. The custard in the filling is just enough to hold the fruit together well. The flavor and texture are really all about the fruit. But, it was the nutty, golden crust and crumb topping that stole the show in my opinion. The crust edges held their shape so nicely, and the buttery, golden crumbs on top were just right with the sweet-tart filling. 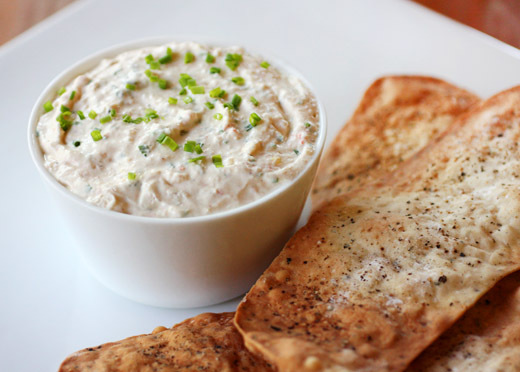 When I was telling you about the new book Basic to Brilliant, Ya'll , I mentioned that I planned to make the shrimp rillettes for Thanksgiving. Well, I did, and I’m so glad that I did. I made the fennel flatbreads too which was the option for making this basic recipe brilliant, and they were fantastic as well. After the shrimp were cooked and pureed with butter and cream cheese, the mixture needed to be chilled for at least eight hours, but a quick taste let me know we’d be in for something delicious. While the rillettes chilled in a covered ramekin, I set about making the flatbreads and learned a good lesson. After rolling out pieces of dough as thinly as possible, they were supposed to have been placed directly onto a baking sheet that had been brushed with olive oil. I somehow thought it would be a good idea to use a silpat brushed with olive oil and placed on a baking sheet as you can see in the photo below. The silpat prevented the flabreads from browning in the oven. So, then I did as I was told in the recipe and baked the next few directly on a baking sheet, and they were golden, crispy, fennel seed-flecked perfection. 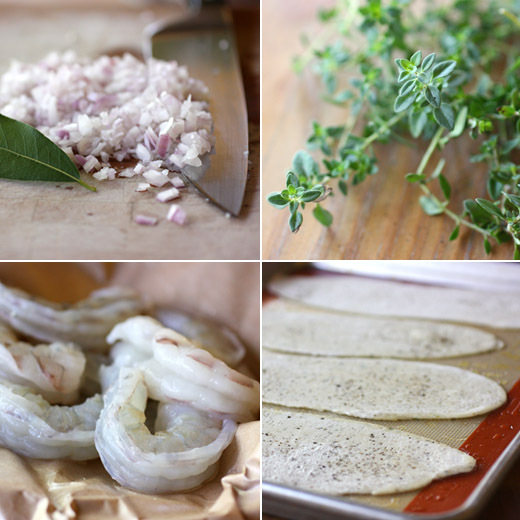 To begin the rillettes, shallots were sauteed in oil with a bay leaf, and then peeled and deveined shrimp were added with some white wine. The shrimp were seasoned with salt and pepper and just cooked until pink. The mixture was transferred to a food processor and pureed with butter, cream cheese, lemon zest, and chives. You could then place the rillettes into individual jars for serving, but I placed the entire mixture into one ramekin and covered it with plastic wrap pressed directly on the surface. The ramekin was chilled overnight, but it could have been made a few days in advance. The dough for the fennel flatbreads was quickly mixed in the food processor. Bread flour, sea salt, fresh thyme leaves, and fennel seeds were pulsed, and then cold water was added and pulsed until the dough formed. The dough was removed from the processor bowl and kneaded until smooth. Then, it was divided into ten pieces, and each piece was rolled out as thinly as possible. After rolling, each piece was sprinkled with salt and pepper and given one more roll with the rolling pin. To bake, the flatbreads should definitely be placed directly on a baking sheet that has been brushed with olive oil. They baked for about 20 minutes. 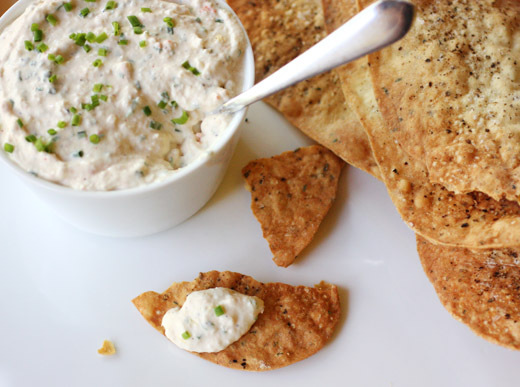 The flatbreads were fragrant from the thyme and fennel seeds, and they snapped easily into bite-size pieces to be spread with the rillettes. And, those rillettes were rich and decadent, and the wine and lemon zest added lovely flavor. This is an ideal item for a party since you’re required to make it in advance, and the flatbreads also store well for a few days. Once it’s served though, it disappears quickly. Sometimes cooking is all about tradition and following certain rules about what ingredients classically belong together in a given type of cuisine. Other times, cooking is about what’s delicious and creating new combinations based solely on great flavor. What I like about Girl in the Kitchen , the new book by Stephanie Izard of which I received a review copy, is that it follows the latter approach. Izard, the first and only woman to win the Top Chef title, strives to balance a mix of flavors in every dish to “make your whole mouth happy.” So, you’ll find miso used in dishes that aren’t otherwise Asian-inspired, truffle oil mixed with poblanos in a vinaigrette, and shrimp cooked with sambal paste for a mango gazpacho. The book offers a fun approach to cooking in that it’s suggested to be used as a guide rather than strictly followed. She encourages you to think about what each ingredient brings to a dish so that if you want to make substitutions, you can choose something else that will work similarly. I’ve marked several pages of recipes I plan to try. Those include the crispy chickpea fritters with salsa verde, seared duck breasts a l’orange with braised duck spring rolls, roasted radishes with blue cheese peanuts and cilantro, and the miso-marcona almond butter for sauteed scallops. Last weekend, I wanted a salad with zippy flavor to wake up one more meal of leftover turkey, and the shaved fennel and bok choy salad with ginger vinaigrette fit the bill. Although it’s called a salad, the thick dressing is intended to coat the vegetables like a slaw. The vinaigrette is an emulsion with Dijon mustard and an egg yolk, but the flavor is all about the ginger. An entire half cup of minced fresh ginger is used, and don’t be afraid. It mixes into the vinaigrette nicely, and once it’s incorporated with the fennel and bok choy, the flavor is perfect. The salad also has basil and cilantro, and delightfully, I actually have both of those herbs in my garden in the fall. My basil is on its last legs, but I had plenty for this use. Thinly sliced bok choy and fennel shaved on a Benriner were tossed with chopped cilantro and a chiffonade of basil. The dressing was made in a blender with minced ginger, shallot, Dijon mustard, white balsamic vinegar, an egg yolk, soy sauce, maple syrup, and grapeseed oil. Of course you can add whatever amount of dressing you prefer, but a generous coating was lovely here. 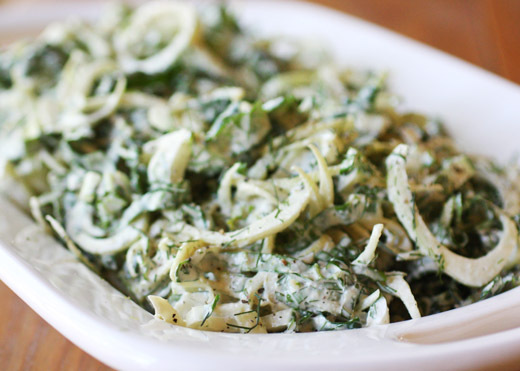 There’s freshness from the fennel, ginger, and herbs, but this is no deprivation salad. The dressing’s richness prevents that. Next time, I might turn this into a meal in itself by adding some crunchy cashews on top. Radishes might be nice too for added color. This book already has me thinking creatively about how to use it, and I can’t wait to spend more time with it. 1. 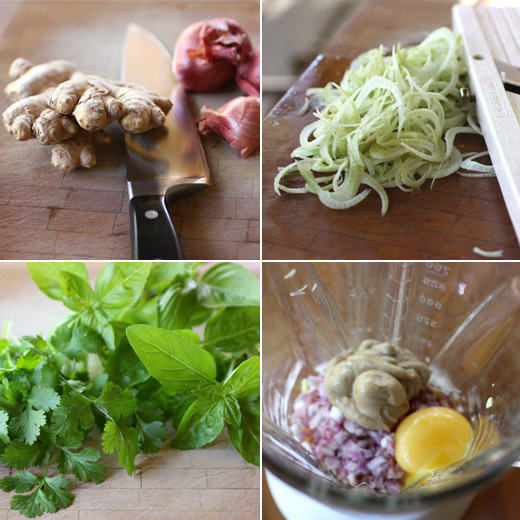 To make the vinaigrette: In a blender, combine the ginger, shallot, mustard, vinegar, yolk, soy sauce, and syrup. On low speed, slowly drizzle in the oil until the dressing is smooth and thickened. Season with salt and pepper. Cover and refrigerate until needed. 2. To make the salad: Remove the stalks from the fennel, cut the bulb in half, and shave it thinly on a mandoline, shaving around the core. 3. Cut off the bottom couple inches at the base of the bok choy and discard. Be sure to wash off any dirt and fully dry the leaves. Pile a few leaves on top of each other at a time and cut them crosswise very thinly. 4. 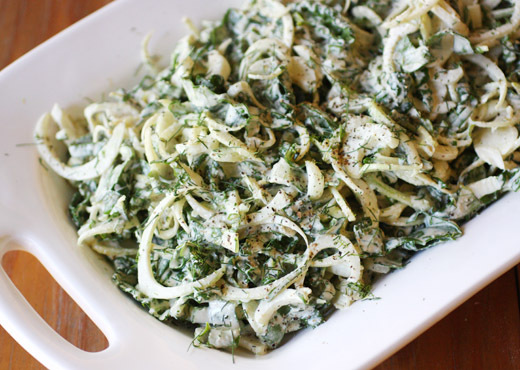 Put the fennel and bok choy in a salad bowl with the basil and cilantro and toss with the dressing. Add as much as you like; I prefer this salad to be heavily dressed, like a slaw. Season with salt and pepper. Drink Tip: Wit beer is pronounced just like wheat beer, and technically it is the same, but these Belgian-style wheats have less of the clove and banana notes you’d get out of German hefeweizens and more clean citrus notes that line up perfectly with fennel and ginger.